Some of you noticed that it has been very quiet on the Alphabet Soup front. I had to go to hospital suddenly and then I had an operation. It was quite an adventure! But I’m back at the desk now. And it’s all hands on deck to get the summer issue out as soon as possible. Thank you for your patience. It’s not long until the school holidays arrive. Enjoy your last days of term and keep an eye on your letterbox for the summer issue of Alphabet Soup—out soon! September 13th is Roald Dahl Day! I loved reading his books when I was growing up, and I’m still reading them. Now my kids are reading them—my daughter really likes Matilda. Then, when I was 15, I had to learn a poem off by heart to recite in front of the class. I was very slack and I didn’t think about the assignment again until three days before the recital. In a bit of a panic, I borrowed Roald Dahl’s Revolting Rhymes from the library and I spent two nights frantically learning ‘Jack and the Beanstalk.’ It was fun and actually not too hard to memorise (even though it’s quite long) because of the rhymes and the way the story unfolds. And because, when you have someone listening to you reciting it (and they don’t have the book in front of them, so they can’t read ahead) you can’t wait to get to the funny bits! 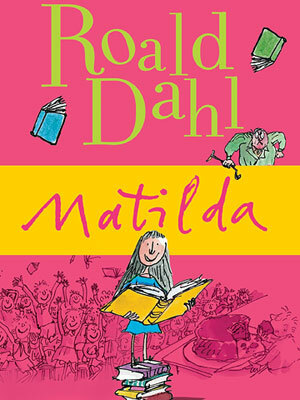 Visit the official Roald Dahl Day site for a free PDF with Roald Dahl Day activities. You could have a Roald Dahl Party to celebrate your favourite books any day, of course. It doesn’t have to be 13 September! 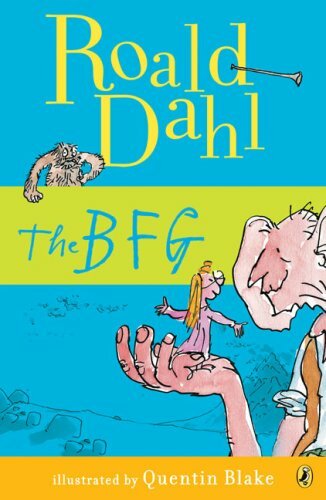 Here’s my favourite Roald Dahl Book. What’s yours? 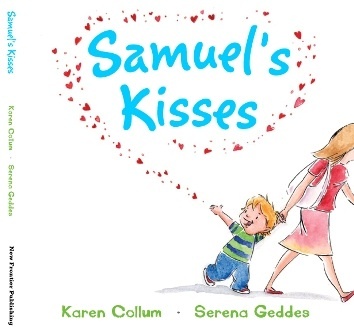 I’m interviewed over at the Kids’ Book Review site today. You can read a bit about me and about why I started Alphabet Soup magazine. Tomorrow we are taking the spring 2009 issue on a blog tour! From 1 – 7 September, Rebecca Newman (Alphabet Soup‘s Publisher and Editor) will be visiting 7 different blogs, where she’ll be answering questions about the magazine. Find out what started it all, how the magazine could be used in the classroom, who’s on the team at the magazine, and more! The spring ’09 issue marks the magazine’s first birthday. To celebrate, there’s a set of the first four issues to be won – so make sure you visit Robyn Opie’s blog on 6 September! Tomorrow you’ll find us at our first stop on the tour, talking to Dale Harcombe at ‘Write and Read With Dale‘. MEDIA RELEASE: Alphabet Soup. A new children’s literary magazine. Perth editor and mother-of-three, Rebecca Newman, has launched Alphabet Soup magazine for primary-school aged kids who love books and reading. Rebecca started work on the magazine 18 months ago, after she was unable to find a suitable magazine for her young daughter, who is an avid reader. Schools, children’s libraries and early childhood educators have been enthusiastic about issue 1. Specialist literacy educators have previously imported similar publications from Canada and the USA — while despairing at the lack of a local product. Alphabet Soup magazine, with a section devoted to showcasing children’s writing, has found a ready-made readership. Greg Mitchell’s colourful and quirky illustrations round out a really fun read! 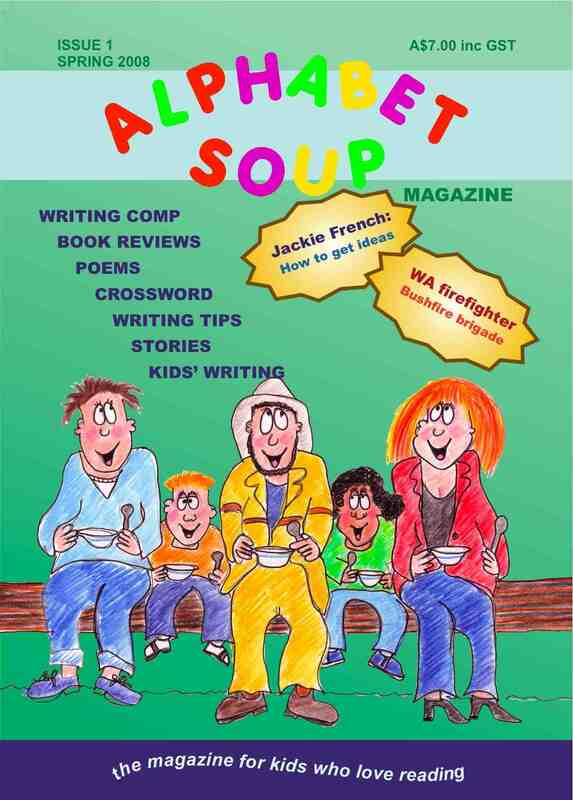 Alphabet Soup is published quarterly and can be ordered online (www.alphabetsoup.net.au), or by sending address details with a cheque or money order to the publisher. Free postage and handling until 31 December 2008 for all orders with Australian delivery addresses. Contact the editor for postage and handling costs to addresses outside Australia. Rebecca Newman is available for interview.